Advancement of Science & Technology, inclusive approach is crucial to become a developed nation: VP Science & Technology to make people’s lives better; Scientists must address challenges such as climate change and global warming; This is the most appropriate time for India to leverage the many opportunities before it & leap frog in development parameters; Step up investments in Science & Technology to support innovations; Presents NASI-Scopus Young Scientist Awards 2018. 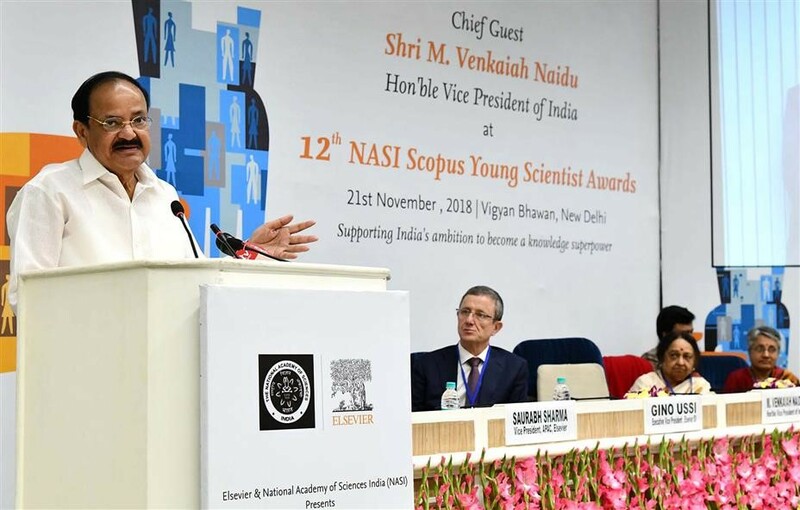 This is the most appropriate time for India to leverage the opportunity and leap frog in development parameters by overcoming challenges such as poverty, hidden hunger and economic inequalities, he said, while addressing the gathering after presenting the National Academy of Sciences, India (NASI) and Elsevier awards 2018 aimed at promoting scientific excellence among youngsters, at Vigyan Bhawan in New Delhi, today. ‘Advancement of Science and Technology and an inclusive approach to development is crucial in addressing challenges such as poverty, illiteracy, gender discrimination and others’, he said and added that a nation cannot become developed unless these issues are addressed. ‘Only science can throw up solutions for the present and emerging problems in the years to come. The onus lies on the shoulders of the young scientific community to look for a way out for such pressing tribulations’, he said. that the children and youth must develop scientific attitude, starting from school days, the Vice President stressed the need to create the right eco-system in universities and scientific institutions for research to thrive. He added that there was every need to kindle interest in science among school children by adopting innovative teaching methods. 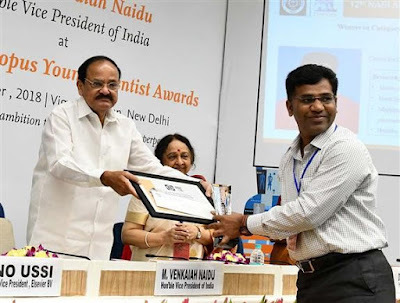 Shri Naidu opined that as a growing nation, India cannot afford to ignore the importance of rankings of educational institutions. ‘While we have seen significant growth in research activities across India, our universities are still not able to feature in top 100 due to a variety of reasons’, he added. The Scopus Young Scientist Awards are part of an Elsevier’s global initiative to support early career researchers in their quest to advance the frontiers of science across a broad range of disciplines. In 2009, India officially adopted the program within its scientific community through Elsevier's collaboration with the National Academy of Sciences, India.